We offer cut-to-order American artisan cheeses. From bloomy rinds to semi-soft, tangy blues to fresh cheeses and amazing cheddars, we have a style for every cheese lover. They come from across the country, as far away as Cypress Grove Chevre in CA and as close as Mattawan Artisan Creamery in Mattawan, MI. Explore new flavors, ask for a taste, we love to sample cheeses with you. Check out our assortment of cheese tools that will help in preserving, storing and serving cheese. Entertaining? Our cheese and meat experts will create custom cheese and charcuterie platters with all your favorites including Food Dance Crackers, bread, and accouterments. 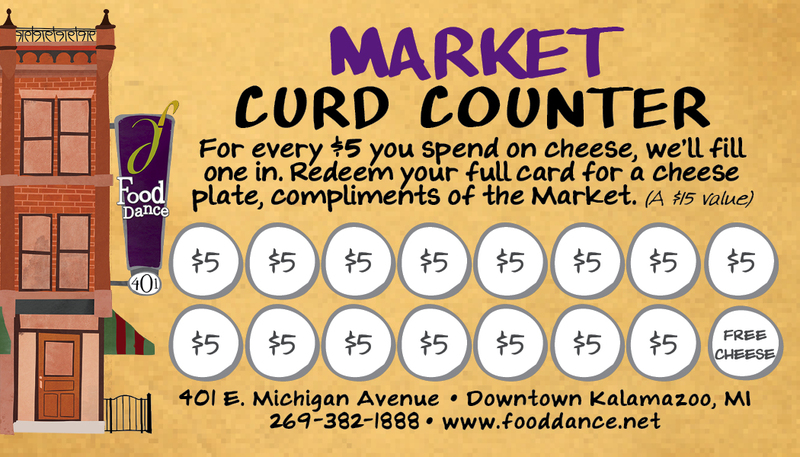 Start a Curd Counter Card today and nibble your way to free cheese.